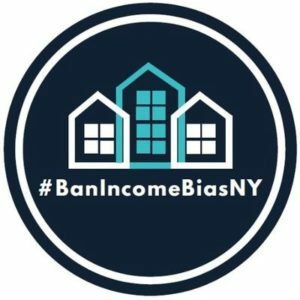 #BanIncomeBiasNY to end NYS Source of Income Discrimination - Long Island Housing Services, Inc.
Long Island Housing Services, which worked with local coalitions to pass laws in Nassau and Suffolk counties to outlaw Source of Income Discrimination, has joined a statewide coalition to ban it throughout New York State. A statewide coalition of advocates led by Enterprise Community Partners, ERASE Racism, the Fair Housing Justice Center and the New York Housing Conference kicked off Fair Housing Month today by launching #BanIncomeBiasNY, a campaign to amend New York State human rights law to include a lawful Source of Income (SOI) provision that protects individuals using government assistance or other forms of non-wage income to pay their rent from housing discrimination. Assembly Bill 10077, introduced by Assemblyman Walter T. Mosley, intends to amend the State Human Rights Law to include source of income as a protected class, thereby prohibiting housing providers from discriminating against individuals who use non-wage income or funds from federal, state or local governmental entities to pay for all or part of their housing. The Coalition will be holding a press conference and lobby day at the State Capitol on April 24 to encourage the passage of the bill by the end of the legislative session in June. Thus far, more than 40 coalition members from across the state have signed on in support of the legislation, including affordable and fair housing organizations, senior advocacy groups, homelessness advocacy groups and tenants’ rights organizations. Too often, people in my district and around the state are turned away from apartments due to baseless income discrimination. Even with some local laws banning this, there are many people in this state who face the possibility of homelessness simply because landlords do not approve of where their income originates from. But public assistance should not prevent someone from living in an apartment they can afford. I know that this bill will improve the lives of families in my community and throughout our state. The lack of SOI protections impacts some of New York State’s most vulnerable populations, including the elderly, persons living with disabilities, domestic violence survivors, persons who are experiencing homelessness, families with children, ethnic and racial minorities and veterans. SOI discrimination drives poverty and segregation by restricting low-income families to certain areas, often with higher crime and underperforming schools. SOI discrimination is also often used as a proxy for illegal discrimination based on disability, familial status or race. “New York Housing Conference is proud to be part of this coalition to open up housing options for New Yorkers utilizing housing assistance or on fixed incomes who often face significant barriers in finding safe and decent rental housing,” said Rachel Fee, executive director, New York Housing Conference. The Statewide Source of Income Coalition, originally organized in 2016 by ERASE Racism, is a vast network of advocates that supports amending the New York State Human Rights Law and expanding the protected classes to include “Lawful Source of Income.” Currently led by Enterprise Community Partners, the Coalition continues to ensure the housing choice of all New Yorkers. Follow the #BanIncomeBiasNY campaign on Twitter at @banincomebiasny. If you are interested in joining the Statewide Source of Income Coalition, please email banincomebiasny@gmail.com. For any additional questions or concerns, please contact Aliya Brown at 212.284.7214. About Long Island Housing Services, Inc.
Long Island Housing Services is a nationally recognized Fair Housing agency serving both Nassau and Suffolk counties. We are unique in our multifaceted services and unparalleled in our commitment to fair housing advocacy and enforcement. Long Island Housing Services’ mission is the elimination of unlawful discrimination and promotion of decent and affordable housing through advocacy and education. Founded in 1969, Long Island Housing Services, Inc. (www.LIFairHousing.org) is a private, non­profit HUD-qualified Fair Housing Enforcement Organization and a HUD-approved Housing Counseling agency. Its work is supported in part by HUD’s Fair Housing Initiatives Program for Private Enforcement.